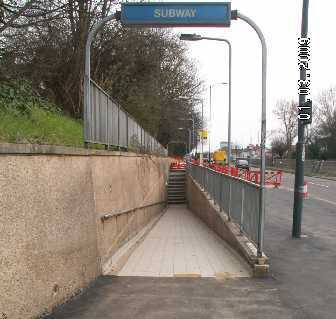 Pictured below, is the entrance to the underpass in Woodford Avenue just along from Lord Avenue. On the other side of Woodford Avenue is the junction with Woodford Bridge Road which hosts Beal School and the Sinclair Community Centre. This underpass has a history of anti-social behaviour and attacks [I do not have any information to indicate they were racist]. 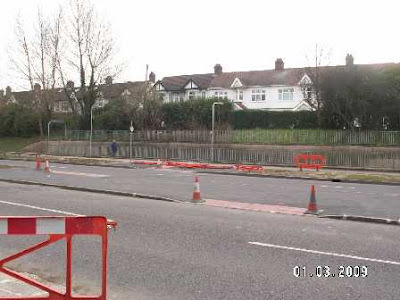 For the last few weeks there have been road works going on here and the bus stop has been out of action, picture below. Now we can see what is happening, picture below. An overground crossing is being constructed. I don’t know yet but I expect it to have traffic lights and buttons for pedestrians to operate. 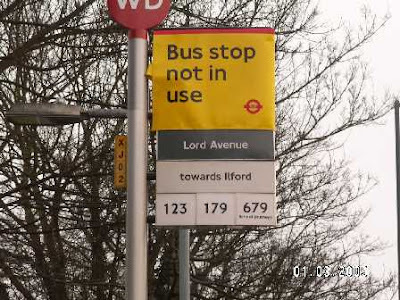 The bus stop will presumably be moved further along the road or abandoned. Over the last few years quite a few surface level Traffic Lighted pedestrian crossings have appeared on TfL controlled roads in Redbridge. In Woodford Avenue - at Lechmere Avenue [Tescos], at the junction with the Beehive roundabout and at Gants Hill Crescent. In addition there are a couple more either side of Gants Hill in Eastern Avenue, BUT none of these replaced an underpass. So, the question now is, can the residents of Chadwell Heath expect similar treatment for the notorious underpass further along Eastern Avenue at the junction with Somerville Road? Pedestrian crossings on dual carriageways? utter madness. No doubt when a pedestrian get knocked over, injured or worse, drivers will be vilified and speed humps / traffic calming measures / cameras installed. Who dreams this nonsense up? TfL? highways officers? politicians? Subways are there for a reason, to keep pedestrians away from busy dual carriageways and to keep traffic moving. Pedestrians should cross such roads via a subway or a pedestrian bridge. The previous London Mayors policies are continuing, cycle routes, pedestrian crossings and yet more street clutter, islands, humps, bollards etc etc, when will someone call a halt to it all? Why should pedestrians, parents with prams or buggies, the elderly, the disabled or for that matter bus users or cyclists have to travel out of their way for the convenience of motorists? Let the cars go underground, overhead or the long way round. Ground level within a habited area is for people. The footways are there for people and they have as much right to have their facilities connected and easily accessible in safety. And some wonder why our sense of community [that is the connection between people, not cars] is broken. Convienience of motorists? practicalities of not getting struck by moving traffic, with crossing points placed in such places that put the pedestrians at even greater risk. How is it sensible to have a crossing point in the middle of a fast stretch of dual carriageway? Planners think that traffic lights and crossings make for a safe place to cross, newsflash, if placed in the incorrect place they do not. Badly designed traffic management measures make our roads and streets even more dangerous, Redbridge is the riskiest place in London to drive, and Havering third for young road deaths, something somewhere is wrong. Let TfL waste yet more of your cash clogging up the streets with yet more street clutter, however did we manage before? Motorists will continue to pay through the nose with excise duty, fuel duty, insurance duty, MOT's depreciation etc and continute to see little benefit as the cash gets diverted elsewhere. Next time some cyclist, pedestrian, disabled person or the elderly gets under my wheels through not looking, thinking they have a god given right to step off the pavement at will, or get on dual carriageway mistakenly should they strike my vehicle, I shall demand proof of insurance to cover the damage. Oh what's that you say, you do not have insurance? If I said that I wouldn't have a licence for long. Major traffic routes are just that, MAJOR TRAFFIC ROUTES, not bijou pedestrian precincts, where vehicles and pedestrians mix at 10mph. Traffic going underground, overground the long way round?, we'd love to, unfortunatly sucessive governments have not invested DRIVERS money correctly, leaving us with the current situation of many many millions of £££ needed for road infrastructure. Will pedestrians, disabled, elderly, cyclists etc etc, wish to pay for the road upgrades needed? And what is TRAFFIC? It is the transmission of people and goods from one place to another. TRAFFIC is NOT the sole preserve of the internal combustion engine. It INCLUDES pedestrians, prams, buggies and cyclists. I would argue that to get from one side of a road to another, to access or get home from a bus stop IS a MAJOR TRAFFIC ROUTE!!! It is part of the transport infrastructure and has as much right to be given priority as any other. Do you mean before Eastern Avenue and Woodford Avenue were made dual carriageway and carved a dividing line across those communities, separating what were once neighbours. Think about that word community, it is a derivative of communication, which reflects the need for people to meet each other. The reason, and the ONLY reason, drivers of motorised vehicles are required by law to have Insurance is simply because motorised vehicles are a MAJOR cause of premature DEATH in this quaint country of ours. Take a virtual trip around Waltham Forest with Freewheeler. In today (2009) there are many millions of vehicles on the roads, to revert to 1959 is not going to happen, hence why the internal combustion engine overtook the horse. Subways were introduced as a SAFE means to cross a BUSY DUAL CARRIAGEWAY, planners showed COMMON SENSE, that an underpass was the safest way for pedestrians to cross a busy DUAL CARRIAGEWAY. Remember that the transfer of goods is / was vital to the economy. The council put up signs opposite the retail park, with explicit warnings that a pedestrian could DIE if they chose to cross at a particular point. As technology continues to evolve "motorised" can encompass many vehicles, and many people will find that the law does not discriminate in the definition of what constitutes a "motorised" vehicle. Death, reckless, and unlawful driving in this country is becomming enforceable for many types of motorised / unconventional vehicles. What monetary claim do I have against a cyclist(with no insurance)who knocks me down as I exit form my front gate crossing the footpath to get to my car? There WILL come a time when insurance against third party HIGHWAYS, roads / footpath risks will become MANDATORY for ALL users. I hope future governments spend the money wisely. Yes, but it hasn’t turned out that way has it? People are terrified to use them, so they remain no-go areas because of the druggies and muggers. It’s the law of unintended consequences. Yes but 2.4 mph, half walking pace, is hardly likely to result in much damage. Oh yeah! Fine and 3 month ban. That’s “enforcement” is it? What monetary claim do you have if a jogger knocks you down? Or even a mum with a pram? What monetary claim do I have if YOU knock ME over whilst fighting for the biscuits at an Area 3 meeting? Are you really proposing that we should move towards the US litigious model? Subways alledgedly being a place occupied with druggies and muggers is an enforcement issue, maybe CCTV, extra patrols, stop and search should be rigourously pursued? A motorised vehicle is STILL a motorised vehicle, REGARDLESS of what speed it can achieve, some of those disability scooters are capable of 15 / 20mph and have killed pedestrians. Last time I looked causing death by reckless or dangerous driving carried 10 years imprisonment, and judging by a recent case of someone who killed a pedestrian, I certainly wouldn't want to be up on that kind of charge. Having seen the proliferation of Lawyers4you, Claimsdirect, injurylawyersRUs,and youknowyouwanttoclaim adverts, I would say that people are being encouraged into litigation over personal injury claims, the US litigious model is already here. If you have an asset and are involved in a personal injury claim, the fee's alone for defending that claim can be astronomical, that asset could be at risk, hence why home insurance / motor policies usually have free / inexpensive legal cover, to fight such claims. Maybe it is time for ALL road users to have such cover? I don't go for biscuits at Area 3 - I'm absolutely enthralled by the high level of intellectual discussion emanating from Tweedledum and Tweedledee. One of my allotment friends got fined £30 for riding on the pavement, slowly and no pedestrians to disturb. (Local cops, Fencepiece Road). Consequently, since I count the pennies never mind the pounds, I ride my three-wheeler contraption on Fullwell Avenue. Not for the faint hearted but I am motivated. I rather get flattened on the road rather than pay a fine. Now, I am going to sing Newbie song: Clear the streets of the idiotic speeding moronic drivers and also people who ignores the markings and cut corners! (And yes I do drive, but like an escargot, on the limit, not 10% plus two added to whatever number(in miles that is). The conversion in km/h would be quite interesting!